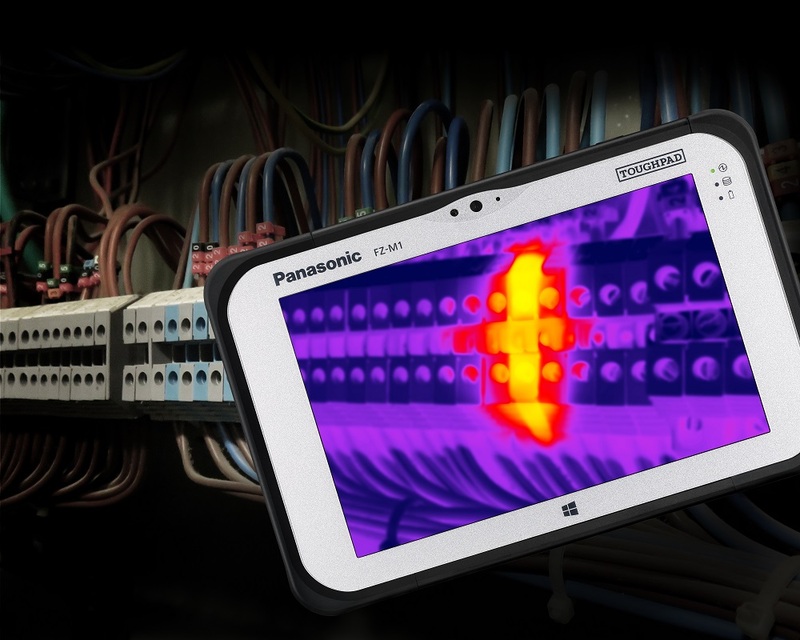 Start computing in the rain with Panasonics new ToughPad FZ-M1 ruggedised Windows 10 Pro tablet. 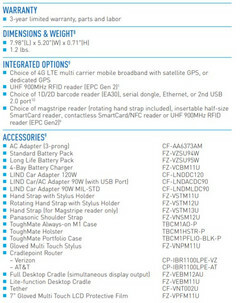 As is common with ruggedised devices, it is equipped with an older generation SoC — Intel 6th generation in this case. 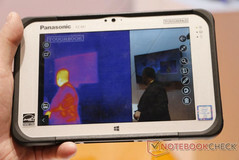 The integrated FLIR thermal imaging camera indicates the type of use that Panasonic is targeting. Panasonic has added a new ruggedized tablet to the ToughPad lineup. 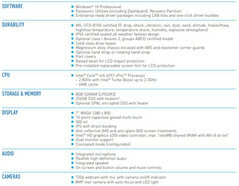 The FZ-M1 is a relatively compact 7-inch (1280 x 800) tablet running Windows 10 Pro and a dual-core/four-thread Intel 6th generation processor. There is a ‘value option’ which includes an Atom processor, but this isn’t showing in the spec sheets or on the website, only in the press material. The headlining feature is the integrated FLIR thermal imaging camera which has a thermal resolution of 160 x 120 pixels and can measure temperatures between -20 and +400 Celsius ( -4 to 752 Fahrenheit). The FZ-M1 is intended for the assessment and capture of thermal imaging data in areas such as utilities and cool chain. As a ruggedized device, it is rated IP65 (dust tight, water jets) and can withstand drops from 180cm (71 inches). 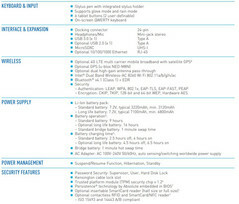 Battery life is reported at 8 hours and is user swappable for extended use on the go. The MSRP for the ToughPad FZ-M1 Core M5 6Y57, 8 GB RAM, and 256 GB SSD starts at US$2749, with availability from the end of February. anasonic präsentiert heute auf dem Mobile World Congress eine neue Tablet-Variante der „Full Ruggedized“ Schutzklasse: das TOUGHPAD FZ-M1 mit einer integrierten Wärmebildkamera. Die Gerätekombination wurde für die Erfassung, Auswertung sowie direkte Verarbeitung von Wärmebildern und -videos (Pro Version) entwickelt und macht das Hantieren mit mehreren separaten Geräten obsolet. Das handliche 7“ Outdoor-Tablet ist mit einer FLIR Lepton Mikro-Wärmebildkamera ausgestattet und läuft mit Windows. Mobile Mitarbeiter machen damit vor Ort präzise Wärmebildaufnahmen und können diese Aufnahmen anschließend mit demselben Gerät verarbeiten – etwa durch die Verknüpfung mit anderen Geschäftsanwendungen oder dem Ergänzen von Metadaten wie QR-Codes. Die Wärmebildapplikation wurde von Panasonic entwickelt und basiert auf Panasonic‘s 20-jähriger Erfahrung in der Bereitstellung kompletter Hard- und Softwarelösungen für Geschäftskunden. Mit den Softwareoptionen Standard und Pro (Zusatzlizenz) können Nutzer thermische Hoch- und Tiefpunkte messen, Fotos oder Videos (Pro Version) aufnehmen und Metadaten wie QR-Codes ergänzen. Diese zusätzliche Bearbeitungsfunktion nutzt die Funktionalität sowie die Konnektivität des Panasonic TOUGHPAD Tablets und ermöglicht die Integration der Bilder und Videos in weitere Geschäftsanwendungen.